As it gets harder to find funding to move your innovation from the bench to the marketplace, small business grants and contracts are more important than ever. 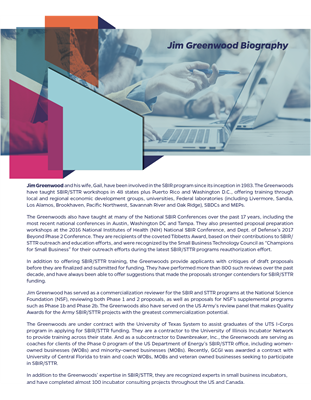 Help increase your competitive edge by joining us for our upcoming SBIR (Small Business Innovation Research)/STTR (Small Business Technology Transfer) workshop run by Jim Greenwood of Greenwood Consulting. This is open to all researchers, postdocs, and inventors interested in securing funding to help develop your research for commercialization. 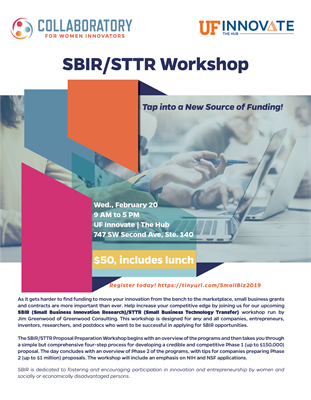 The SBIR/STTR Proposal Preparation Workshop begins with an overview of the programs and then takes you through a simple but comprehensive four-step process for developing a credible and competitive Phase 1 (up to $150,000) proposal. The day concludes with an overview of Phase 2 of the programs, with tips for companies preparing Phase 2 (up to $1 million) proposals. The workshop will include an emphasis on NIH and NSF applications. 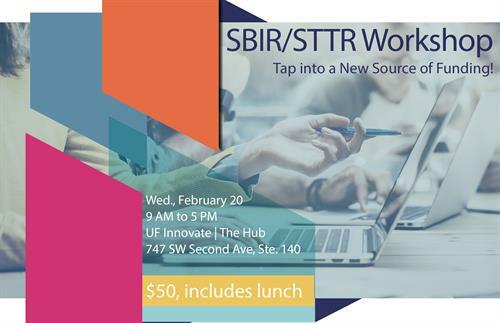 SBIR is dedicated to fostering and encouraging participation in innovation and entrepreneurship by women and socially or economically disadvantaged persons. Sponsored by the Collaboratory for Women Innovators. Questions? Contact Kathy Sohar ksfl@ufl.edu.